If excess admissions in undergraduate courses are curtailed, the cutoffs will touch an all-time high across all courses in DU this year. The pattern in Delhi’s second largest university, Guru Gobind Singh Indraprastha University, where admissions are on, is also not encouraging. It has so far received 34,000 applications for just 250 seats in medicine and the application process will continue till April 10. B Tech programmes have seen 39,000 applications already. The IP university has received 1.2 lakh applications for about 20,000 UG and 9,000 PG seats. DU has 54,000 seats, but more than 60,000 get admission annually as the university policy allows admission to all candidates meeting the cutoff and fulfilling the additional criteria. The city’s universities together have about 82,000 seats, including those in Ambedkar University, Jamia Millia, Delhi Technological University and Indira Gandhi Delhi Technical University. According to CBSE, 2,91,414 students have registered for the Class XII boards, 30,000 more than last year. The increase in board exam candidates, along with the constant intake capacity, signals higher cutoffs. 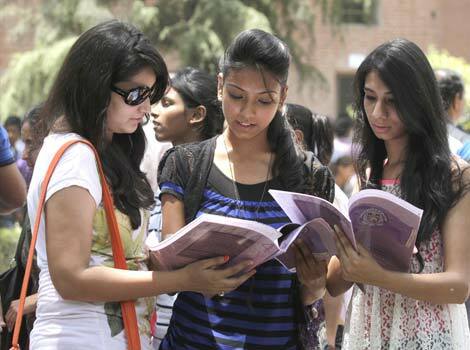 DU vice-chancellor Dinesh Singh suggested changes in the undergraduate admissions this year. He said that we will streamline UG admissions further to help aspirants in filling forms with minimum difficulty. And excess admissions have to stop. Because you (colleges) have a sanctioned strength, you must stay within that strength. We will also ensure the reserved category seats are filled. This means there will be no admission beyond the intake. Last year, there was chaos during admissions to BTech and police were called in to manage the large number of students at Maharaja Agrasen College asking for admission. There were instances of colleges admitting nearly 500 students for 60 seats in chemistry. In 2013, the first cutoff had 43 out of 56 colleges offering commerce at 90 percent and above, while 23 colleges recorded 95 percent and above.